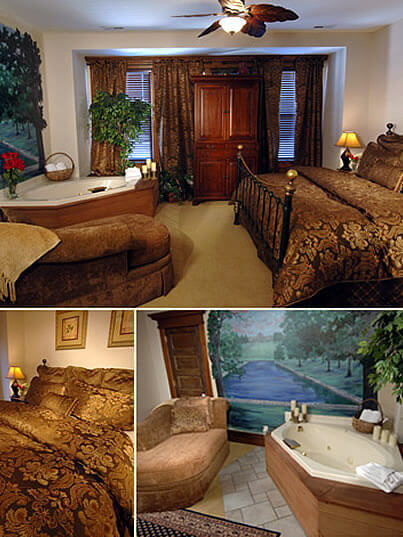 Majestic Forest Park is known as the “crown jewel of St. Louis,” and this romantic Jacuzzi-suite getaway does that lofty reputation justice. Beyond its heavy pocket door lies a spacious bedroom featuring a magnificent king-sized bed and a two-person Jacuzzi, set against the backdrop of a mural by local artist Leslie Faust. The adjoining full bath is equally spacious, boasting a tub, shower, twin sinks, and a roomy dressing area. While staying in the Forest Park Room, why not visit its namesake park, just four miles from the inn? Covering 1,371 acres, this landmark played host to a number of historic events including the 1904 Louisiana Purchase Expedition and the 1904 Summer Olympics. Home to the St. Louis Zoo, the Saint Louis Art Museum, the St. Louis Science Center, the Missouri History Museum, the Jewel Box greenhouse, a sculpture park, ponds, lakes, freshwater streams, and much more, you certainly won’t run out of things to do!